Interior signage definitely sets the atmosphere of an office. If you’re looking for signage for a corporate office, you will want something that looks professional that might incorporate your logo and logo colors. You need to appeal to your clients and think about what will make them want to come back to your business. Children’s Dentistry of Redlands wanted something fun that would make their patients excited to come to visit the dentist. They have an existing beach/underwater theme that they wanted to work with. A theme is a fun and effective way to appeal to kids. Along with new signage, they were in need of a new logo. Our in-house designer was asked to design a logo that would be incorporated in all of the new signage that would suit the beach theme. Many companies that we work with already have an existing logo, however, if you are starting from scratch, we can help you with every aspect of design from your logo, the sign design, to where the sign should be installed. Our graphic designer took inspiration from photos of sea creatures and plants that the customer sent us to create a cartoon turtle for the logo and a fun font for the business name. Once you have your logo established, you want to start using it for all of your marketing. Most companies will use the same logo and colors for their website, storefront sign, lobby sign, vehicle graphics, and any other form of advertising they’re using. Some brands also watermark their photos with their logo which is a good idea if they are going to be posted online. One of the easiest ways to display your logo is by using vinyl. With our plotter, we can cut out small letters and detailed logos from vinyl to be installed onto any flat surface. White vinyl will show up against most backgrounds so it is a good choice for window graphics. We cut out the logo from white vinyl so it can be displayed on their sterilization room window. We also made a lobby sign for them that we will talk about in an upcoming blog. However, if you have a larger office, it is a good idea to display your logo in other places aside from the lobby. Cut vinyl is a simple and affordable way to display your logo virtually anywhere. 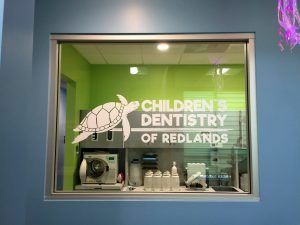 Stay tuned for our future blogs where we’ll go over the rest of the interior and exterior signs we made for Children’s Dentistry of Redlands.